A weekly newspaper has been congratulated by the Prince Charles after celebrating its 240th birthday. 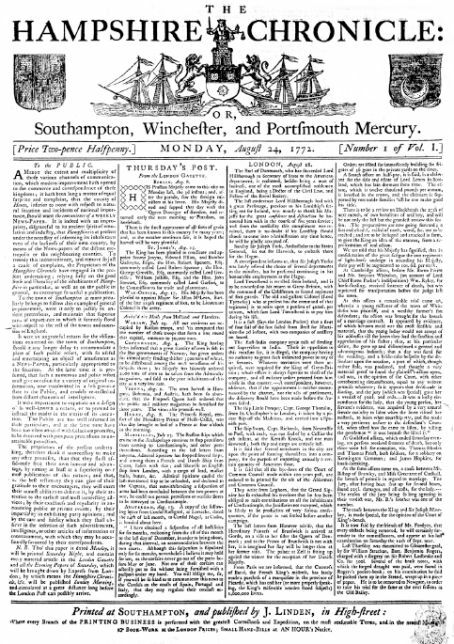 The Hampshire Chronicle first hit the streets in 1772 and it has published an eight-page broadsheet souvenir supplement to celebrate the milestone anniversary. The pull-out looked back at the history of the paper and its coverage of some of the most momentous occasions in history, including the Declaration of Independence and the sinking of the Titanic. It also included a message of congratulations from the Prince of Wales, who praised the paper’s Gardens for Schools campaign, which aims to provide outdoor learning spaces for schools across Hampshire. Editor Keith Redbourn said: “The Chronicle is widely regarded with affection and respect, and it was touching to receive so many messages of congratulations – not least from Prince Charles. The anniversary issue of the paper offered readers a free pint of real ale, specially-brewed by a Winchester micro-brewery, and a raft of offers. Keith also spoke about some of the more quirky articles the paper had published in its history, during a special reception of invited guests in Winchester. Among them was one of the earliest lonely heart ads ever to appear in a newspaper – in November 1774 – where a Mr William Merrett, “a stout and jolly man”, was “in want of a wife”.